Today the sun has crossed the equator and we in the Earth’s northern hemisphere are treated to the introduction of the Spring season. With each spring season comes a celebration dating back nearly 3,000 years. The traditions of this celebration, Nouroz, has changed very little. It is still a time to gather and celebrate with friends and family. It is also a time for indulging in one of life’s greatest pleasures…FOOD! 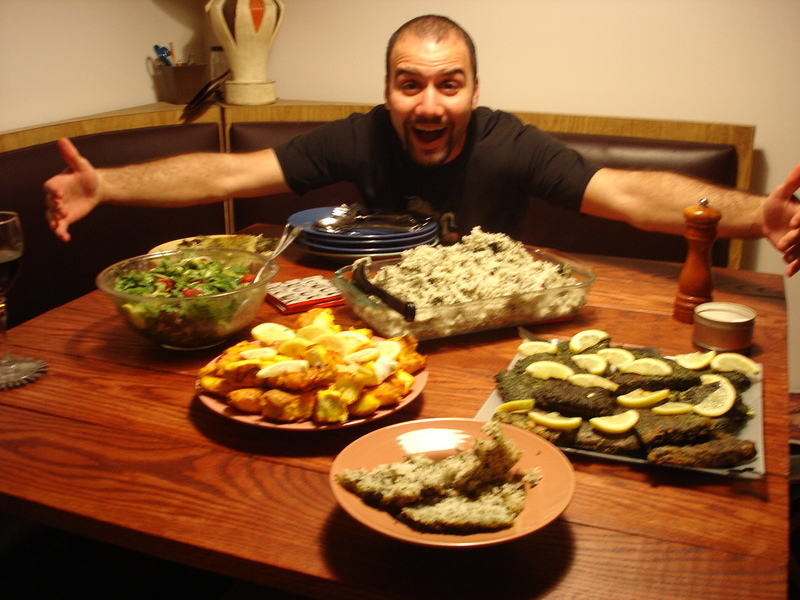 In modern Iran, the traditional Nouroz meal consists primarily of two dishes Sabzi Polo Mahi and Kookoo Sabzi (link to a fine recipe). Since I was unable to celebrate with my family in California I decided to invite what family I have in NYC to a homemade feast, courtesy of yours truly, in Brooklyn. 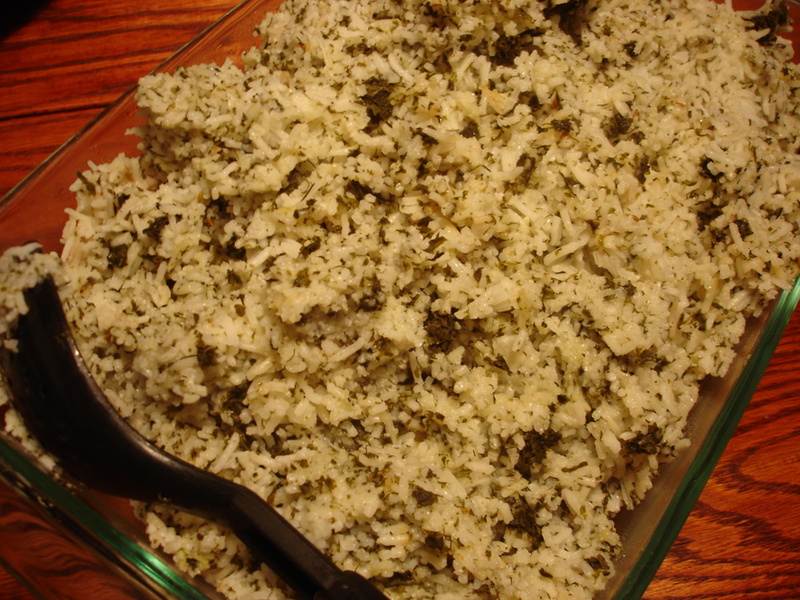 Sabzi Polo Mahi consists of rice with green herbs served with fish. The traditional seasoning for Sabzi Polo are parsley, coriander, chives, dill and fenugreek. Below you can see the Sabzi Polo and Mahi presented in separate dishes. 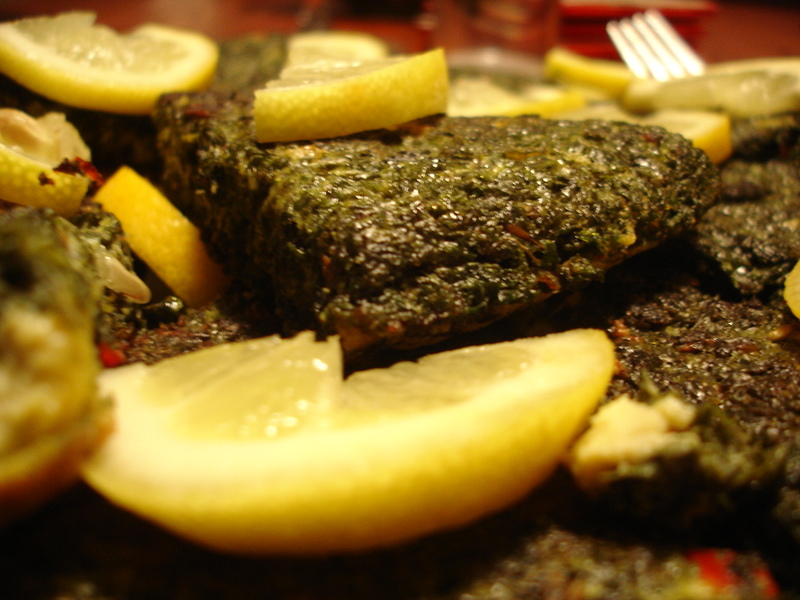 Kookoo Sabzi is an herbs and vegetable souffle. A light and fluffy omelet style made from parsley, dill, coriander, spinach, spring onion ends, and chives, mixed with eggs and walnut. 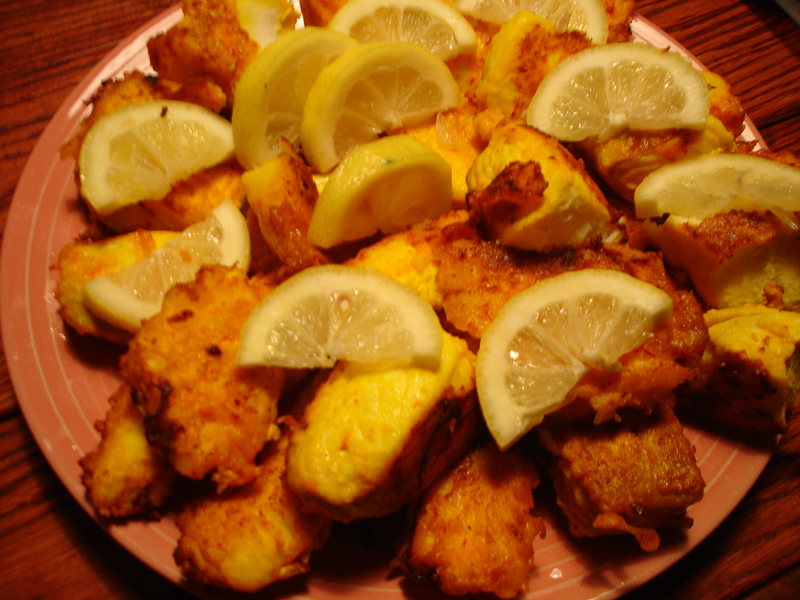 Lemon wedges help to enhance both the flavor and presentation of any Kookoo Sabzi. 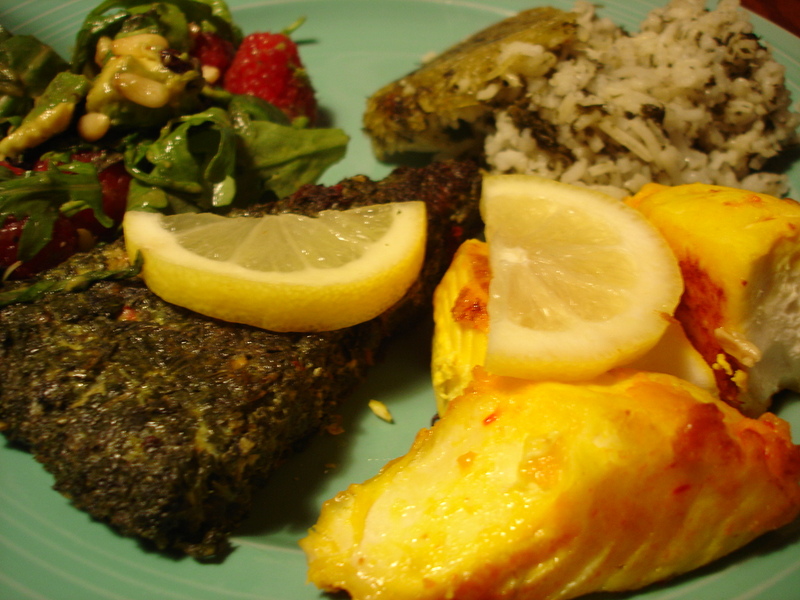 Together Sabzi Polo Mahi and Kookoo Sabzi make for a fantastic meal on any given occassion. To add more flavor to your plate try adding a delicious salad. I was lucky enough to have my sweet girl friend prepare an amazing salad made from avocado, spinach, pine nuts, and rasberries. The salad dressing was made from soy sauce, honey, and mustard. At the height of my glory during the night I embraced my accomplishments with a smile, hungry stomach, and handsome portions for all my guests. After a meal like this you’ll need something to sweeten your stomach. 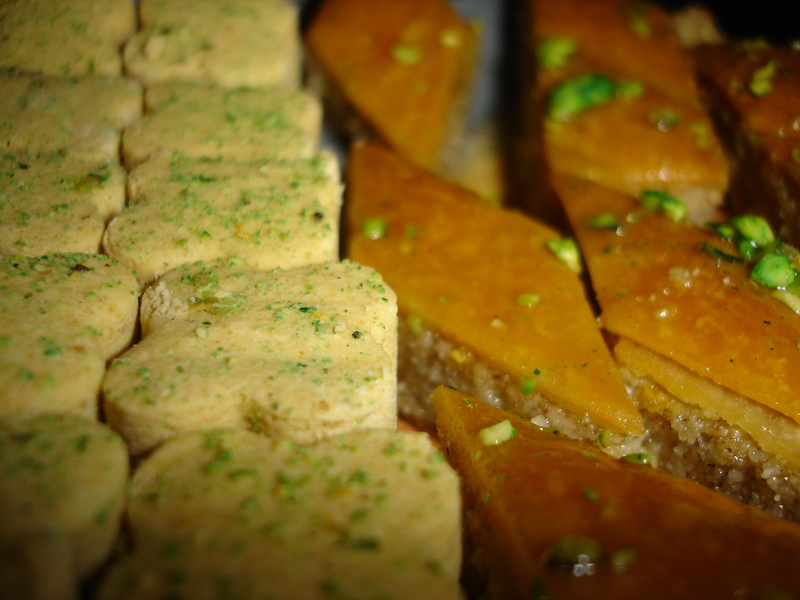 Might I suggest some baghlava and shirini nokhodchi (clover shaped, chickpea cookies). This entry was posted on March 21, 2007 at 6:12 pm and is filed under *jon sublet, holiday, House Party, recipe. You can follow any responses to this entry through the RSS 2.0 feed. You can leave a response, or trackback from your own site. that looks delicious! Aydetoon Mobārak and a pleasant Norouz to my Persian friendlies. when i first glanced over these pictures, i thought, “take me to this restaurant NOW!” to read the entry and find out that this is what you made at home is super impressive. sepi, you rock. this meal was just like Maman’s cooking- and that’s the highest of compliments!